Drop off your documents for destruction. Best for 1-3 boxes. SoCal Shred provides a complete array of shredding services throughout Los Angeles County and Orange County. By now you probably already know you should be using a certified shredding service to guarantee complete destruction of your confidential documents. Our onsite shredding services provide the ultimate protection to limit your companies liabilities. Identity theft is a constant threat, and government regulations mandate proper destruction of an individual's private information collected for business purposes. No business can afford the publicity nightmare and government fines because employees didn't do it right. "You are so quick and efficient!! Literally within 2 hours of my initial phone call our documents have been completely shredded, we received our certificate of destruction and we have an invoice. Amazing! I highly recommend your company to anyone who needs a referral. We will be using you for our future shredding needs"
Regularly scheduled shredding services at your location. One-time service at your location. Emergency services OK.
Drop off your documents for secure destruction and save. You're Protected with SoCal Shred. 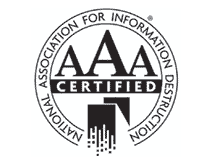 Every mobile, onsite shredding service comes with a Certificate of Destruction. 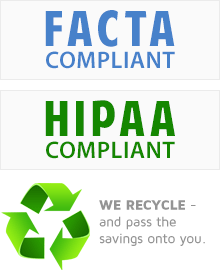 "At Binder and Binder, it's very important for us to maintain the security of our confidential information. SoCal Shred has helped us do that by shredding everything on-site at our location, instead of bringing it back to their plant for shredding like some other companies do. It gives us peace of mind." SoCal Shred is a full-service shredding company that provides a full array of shredding services. However, our roots are in mobile, onsite shredding services. This means that our mobile shredding truck comes to your location and shreds your confidential information while you watch. The chain of custody of your documents starts and ends before our shredding truck leaves your location. Our state of the art mobile shredding trucks destroy your confidential documents at 6000 lbs/hr. We have cameras on both the shredder and collection compartment, so you can witness the entire shredding process start to finish. Your documents will be shredded to an unrecognizable state before we leave your location. "SoCal Shred has always gone the extra mile for us. We were doing a consolidation and needed another container during that process. SoCal Shred gave us the container and didn't charge us anything. Little things like that have been great. We feel secure that we can just dump our confidential documents into the locked containers and it will be shredded properly." SoCal Shred is committed to providing the very best, secure shredding services available. It's the number one reason why we EXCEED NAID Shredding Certification Standards. All of our shredding drivers undergo extensive background checks and drug testing prior to being hired. Our shredding trucks and operations are open to unannounced equipment and operations inspections by a qualified 3rd party.